As you know from my previous post, I'm working through Heisig's 'Book 1' from cover to cover before embarking on 'Book 2'. It has been really good - I'm glad I did it this way. 3. Heisig (here are the articles I have written on the subject) - which was all about learning characters, but focusing on the meaning and not the pronunciation. Podcasts, for example, aren't great for learning to read; and Heisig wasn't intended for learning how to pronounce the characters. But over time, although I have focused on these streams separately, these various methods have overlapped, and things clicked into place. For example, the first such discovery I remember from years ago was the word for 'clever' - cōngming (聪明). By that stage I had only learned the word through audio podcasts, and actually thought it was cóngming (从明) - I guess because 'clever' and 'from brightness' made sense. Even though it turns out I was very wrong! 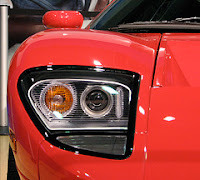 When you buy a red car, afterwards it seems that every car you see is a red car. And similarly when you learn new characters, it seems that every character you see is that new one. On my recent re-do of 'Book 1', I learned 落 (luò), which has the Heisig-keyword 'fall'. I vaguely remember learning it the first time, but I was sure that I had NOT seen it in the last couple of years since learning it. I actually remembered having done this sentence a few times before, and there it was ... 落. I had learned this character and I had used this character. But I most certainly did not remember that character! What’s a pretty girl like you doing here all alone? That sneaky character again! It's everywhere. I have always used different methods for whatever they each do best. And I have not forced myself to integrate these methods. Somehow with zero additional effort, things just connect themselves - something I've learned one way seems to fill a hole in what I have learned anther way. I don't force anything, which allows me to enjoy every moment of learning - nothing is contrived, nothing is done based purely on obligation. Well, Heisig (Book 2) is out - both for simplified and traditional characters. I have a copy - it feels great in my hands. 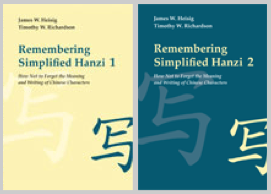 The home of the Heisig & Richardson books is at the Nanzan Institute (and here is a direct link, without having to navigate the menus). Its' funny - people imagine language learning to be such a pain, but I felt like a child at Christmas unwrapping a present. I couldn't wait to page through it. First I went to character number 50,001 - which I had heard about. That was fun. And what a story! Then I read the introduction, and discovered the book was designed that it could be learned in conjunction with Book 1. Not surprisingly, the characters in Book 2 are generally more complex than Book 1 - which really isn't a surprise, but it struck me while paging through the book that it was going to take quite a bit more effort to get through Book 2. But I am looking forward to beginning with the middle to reach the end. Many of us have been waiting for a while for this. It has been interesting to watch how different people have coped with the delay before Book 2. Some people started off as huge fans of the Heisig approach, and once finished as time wore on they started picking fault with the approach. Sigh. Others decided they couldn't wait and started using other books that would take them further than 1500 characters - which I would find extremely confusing as stories start over-lapping and contradicting. When it finally became clear that the time for publishing was 'soon', I picked up my Book 1, and started working through it from the beginning. I knew I had forgotten a fair share of characters from Book 1, and without doubt although I might know what a character means now, I would certainly have forgotten some of the images & stories. And of course I would need the keywords & stories for Book 2! I figured I could manage 10 characters a day (including revision time of previously-learned ones), without impacting on all the other things I had to do, so that was my goal. Yes, 150 days to do Book 1 seems a lot, but I really didn't know for certain when Book 2 would arrive, so I was OK with that. I am now 800 characters in, and enjoying Book 1 properly. Book 2 is waiting patiently but that's OK. It's clear that over the two years since I finished it originally, revision was definitely due! I've written quite a lot about flashcards, and Anki in particular. Naturally, I used Anki here too. I loaded up the free Heisig (Remembering the Hanzi) deck, and set it to 10 cards a day. As mentioned above, today I finished 800 characters, and I'm on track to finish on exactly the day I targeted. So that's it. I've noticed some interesting things about the Heisig approach, and I'll write some more hints articles soon. Have any of you started Book 2? Or are you revising first, like me? And what about those still on Book 1 - what have you decided? Drop us a note below.